As a child, I excelled in everything math and science. My role model was Marie Curie, the woman who discovered radioactivity and isolated a new element. Logic was an easy medium for me, then and now. I worked for almost twenty years as a computer programmer. Still, I couldn’t make sense of economics, no matter how hard I tried. When I was searching for ways to get fast credits so I could finish college quickly and continue to graduate school (after being out of school for several years), I decided to take an Advanced Placement exam in economics. I was hoping this experience would give me enough knowledge that I could finally understand. I pored over the economics bible of the time: Samuelson’s Macroeconomics, 400 pages worth of formulas, text, and examples, and took the test. I passed it with flying colors… and I still couldn’t make sense of economics. A bunch of years later, having left science and computers behind and reoriented myself to the study of sociology, I was walking across campus one day when the lightning of clarity hit me. 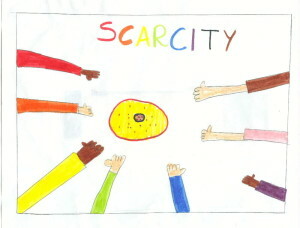 Simply put, I didn’t understand economics because I was unable to accept one of its most sanctified premises: scarcity. Economics is essentially defined as the study of the allocation of scarce resources. Today, I know that there is at least one other core assumption built into economics that I am at odds with: the image of Homo Economicus: the “rational” person whose only goal in life is to maximize his self-interest (yes, “his” was intentional, since the model is almost invariably a man). No one has been able to give me an answer that satisfies me, because the answers are generally based either on suggesting that there isn’t enough for everyone, or on insisting that there would be no limit to what people will take, nor any reason for anyone to produce anything without the incentive of being paid money for producing things and services for sale. For many years, I carried this question with me, letting it marinate and metabolize, never losing my deep and intuitive conviction that another possibility existed. Gradually, I developed clearer and clearer ideas about what that other possibility could look like. Then, I was challenged to articulate, develop, and refine that vision, and put it in writing. Which I did a couple of years ago, through writing a collection of twelve stories that take place in that visionary world, as yet to be born. These stories (three of which you can read here), along with a more “formal” articulation of the vision, are part of my forthcoming book (later this year) – Reweaving Our Human Fabric: Working together to Create a Nonviolent Future. The essential element of this vision will come as no surprise to those who read me regularly: creating a resource allocation system that is based on human needs and on true willingness. In the coming months, I plan to post a few pieces that illustrate aspects of this vision in some detail. For now, I want to quote two paragraphs from the book about the gap and what directions can bridge it. Money can be seen as an incredibly efficient tool for managing the coordination [of production and consumption]. Unfortunately, money is extraordinarily unfit for addressing needs with care. In our current models whoever has the money gets the goods or services whether or not their need is significant. Needs per se do not have power in our current models. This is true both in monopoly capitalism and in a pure market economy based on small producers and small consumers. Ultimately, I don’t see any way to focus on meeting human needs efficiently and with care without eliminating money, and even exchange-based relationships, altogether. I understand deeply, though, why money and exchange are part of our world. If the assumption is that resources are mostly scarce, then placing money as mediator is enormously convenient because it renders the decision impersonal. This means that everyone can preserve the belief that there is no systematic exclusion while the poor remain unable to support their basic needs. I am a sponge for stories that defy the “logical” despair that the gap can lead to. Recently, for example, a friend stunned me when she pointed out that when Wilberforce and his colleagues began their massive campaign against the slave trade, the entire economy was intimately tied to this trade. The abolitionists were few, up against such a formidable obstacle, and they succeeded. The world economy didn’t collapse, and alternative means were found. Some of the most astonishing social transformation of recent decades would have been deemed impossible only years or even months before they took place. (Think, for example, about the Berlin Wall). More directly in the field of economic activity, open source technology is a direct example of the principle of gifting, the most notable example of which is the internet itself, and more specifically Wikipedia. Experiments in collaborative stewarding of resources (the commons, about which I wrote some time ago, along with Gandhian Economics) continue to unfold, and a large and growing network of pure gifting has been created (called Service Space). Even where change or new models have not come about, the logic of corporate capitalism is questioned more and more. At the same time, a near explosion in fields of inquiry that would have been unforeseen until recently is taking place, focusing on empathy, examining the collaborative option, and questioning the “selfish gene” theories. I am less alone than I often think I am. And maybe a new way will be found in time to avert the likely extinction of our species we have created, destined to take with us so many others. Maybe we will rise from our collective numbness and semi-willing participation in the current system, and create a world of gifting, sharing, and willingness. I have never been an observer. From early childhood, I’ve been an active participant in life, questioning inherited meanings, persisting in wanting to know why, about everything, and taking action in the name of values and ideas I had, even if they were not popular. Since I started doing the work I do now back in 1996, I’ve been experimenting with different ways of uncoupling it from money. I remember the first time I heard Marshall Rosenberg articulate his provocative statement: Never work for money, and make sure you have all the resources you need to continue to do your work. This statement has become one of my guiding principles about handling money and resources. Any time I operate within the logic of exchange, I work for money. Any time I manage to find a way for people to have access to my offerings outside of the logic of exchange, I rejoice in my success at giving myself and those other people a peek into the future I want to create. The risks are real. There’s the risk of not being taken seriously, as if I am not offering something of value if I don’t ask people to give large amounts of money when they attend, and insist on them paying. There is the risk I’ve already written about, of people not joining me in this endeavor, prioritizing instead their personal maximal gain, with the result of immediate unsustainability for me, especially given the number of people whose livelihood currently depends on my ability to generate income. There’s the risk of reaching an old age without personal savings and therefore no known, accepted means of sustaining myself when I am no longer able to generate income. I take these risks lovingly and with immense curiosity. I recognize how deeply steeped in a variety of notions about money so many of us are, and how challenging it is to attempt to subvert that as an individual person. I still plan to continue to experiment (click here to read about and possibly participate in my most recent experiment I am just launching), because I am so committed to learning about how to bring about the world of my dreams, and so determined to do everything I can in support of that, without knowing what will work. The latter form is the one on which Adam Smith based his theories. The conditions for an effective market economy that he designed fall apart when consolidation of production happens. In other words, technically speaking monopoly capitalism is not a market-based economy. For a full discussion of this perspective look at David Korten’s The Post-Corporate World: Life After Capitalism. This entry was posted in Uncategorized and tagged Uncategorized on March 27 / 2014 by Miki Kashtan. I remember reading the beautiful little book, “The Continuum Concept” ages ago, about a tribe in Venezuela that the author lived with for a few years. It’s mostly about childrearing, but one story in particular stuck with me about a man who left the tribe to go to civilization and eventually came back. Tribal members were perplexed by the fact that he had no desire to work when he returned but they also did not ask him or pressure him to do anything. They just found it odd. Eventually, probably weeks or months later, he picked up some tools and started tilling the soil. The thing that was most amazing to me about this was the deep faith the tribespeople seem to have in our innate desire to contribute through work. Just a small note. On your “circle of support” page, you say “Think about it: can you contribute $5 a month without much effort? If you live in North America, that’s about two cups of latte. Don’t ever think that any amount is too small to matter.” Heh… well I took that to heart and tried to enter $5 on the support page and I got the error message: “Please select a donation amount that is equal to or more than $10.00.” Just thought I’d let you know because I’m guessing you didn’t know about the inconsistency. I love the quest you are on for authenticity on all levels, mining for truth, and sharing the pieces you find along the way. I see this process as crowd sourcing-offering what you find for other minds to wrap around and collectively imagine something new and more aligned with our souls into being. I have nothing to add to push this ball forward, as I’m stuck in the same place, of trying to understand having my work taken as valuable and not charging money, sustaining myself and my children without fear or beliefs of scarcity. Beyond contibuting to each other’s needs, what if we raised the bar and thought about a world where people contributed to each other’s joy? What would it be like if we collectively reached that level of abundance thinking?